Bulverde Area Humane Society is a all volunteer, non-government affiliated no-kill shelter providing a caring and secure environment for homeless and surrendered dogs and cats. Our purpose as a no-kill shelter (Limited Intake) is to assist in the pet life cycle through education, spay/neuter assistance, and promoting pet-forever families. We are a 501c(3) non-profit organization, powered by volunteers and tax-deductible contributions. It is a beautiful 2” medal that is colorful and reminds all of us that we can support BAHS and wear a medal for it. The price is only $10 and quantities are limited.The price is only $10 and quantities are limited. 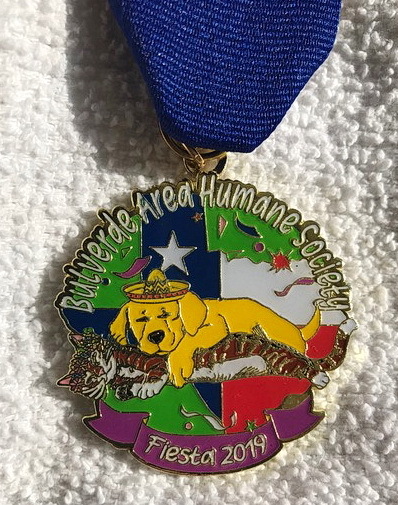 So head on down to the Bulverde Area Humane Society and purchase your 🏅Fiesta Medal 🏅 before they are gone. Lost a dog or cat?